Gaz makes his annual appearance in Devizes! The GAZ BROOKFIELD + Joe McCorriston UK tour swings into town this Friday, the line up how ever doesn’t stop there however, with “Hippo Song” and the best thing to come out of Westbury, Rhys Coleman in tow and the previously well received Welsh wonder, Ellen Cox too. So we thought, why stop there? A west country lad, turned underground hero, a Welsh woman, a northerner, the only thing missing? A Scotsman – So I’ve been *easily* coaxed into welcoming Mark McCabe onto the bill. Those with a keen memory will remember Mark once performed on the Oxygen Thief tour, which came through town last year, welcome back Mark! WE HAVE A MAILING LIST – WITH SOME IMPORTANT ANNOUNCEMENTS…! Yes, the wonderful Rob Escott has knocked us up a Mail Chimp account, and now we’re on the gleam for your email address. Please join it, we promise not to spam. Sheer Music’s Mail Chip List. Coming up in the first email we have voice overs by some cool musicians, you’ll need to sign up to find out about that craic! Devizes Festival 2013’s BIG prize pig show, NEW MODEL ARMY has SOLD OUT. Tickets have sold consistently strong since release in May, with an unprecedented level of feedback having been headed my way, ever since the shows announcement. The full 400 tickets have now been sold, meaning not only do we have a class act in town, but also a class audience, with people from all over the country making the trip. This show is extra special as former bassist Moose Harris, a born and bred Devizes lad, cancelled holidays plans to be at the gig. After 3 or 4 years of begging the festival to revert to on line ticket sales, and the appointment of chairman and kindred spirit in Ian Hopkins, I feel very much vindicated by the use of WeGotTickets and the effect it’s had on this years attendances at events. Not only that, but I have the pleasure of announcing that young Devizes metal band ORCRYST, have won the £200 studio voucher to record their first proper demo, after appearing and impressing at the Devizes Showcase. Recording will be carried out in mid-August, with new local producer Gareth Nicholas (Garethnicholas.org). Gareth recently relocated to Wiltshire from Leicester after studying recording and production at university and has recorded a number of Sheer shows, of which you can hear the results below. Full details over the EP are yet to be revealed – since we don’t know them our selves! Is fresh from his European tour with Jim Lockey & The Levellers and will be in town Friday night, opening for 80’s/90’s Legends NEW MODEL ARMY at The Corn Exchange, Devizes. Here’s a bloody great song from Gaz, ripping into Simon Cowell among other things, enjoy! Tickets for this years centrepiece, sound out event at Devizes Festival – NEW MODEL ARMY, are on sale from tomorrow. Support from local west country boy, Gaz Brookfield. Available from WeGotTickets, priced £20 + booking fee. Or in person from Devizes Festival box office in Devizes books, from 9am without booking fee – OR by downloading the booking form from the official website and sending cheque / credit card details via post – also without booking fee. 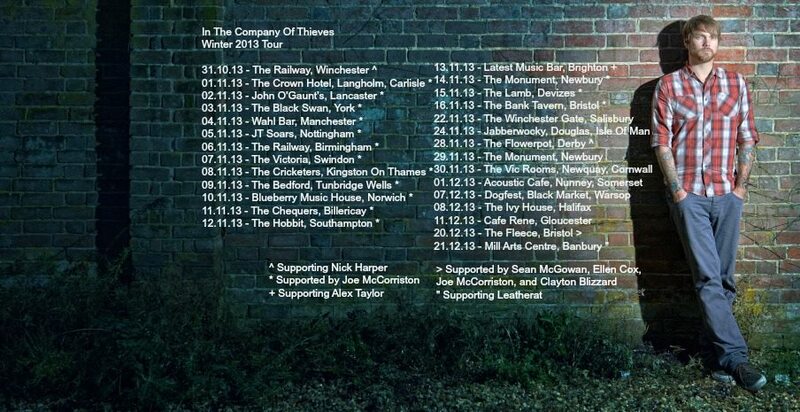 In fact all tickets for all events are now on sale, including the Devizes Showcase, thanks for your support! Devizes Festival is very proud to announce that, GAZ BROOKFIELD, the ex-Swindon resident and current Bristolian, will be returning to Devizes on June 21st, to open for crusty punk veterans NEW MODEL ARMY. Gaz, who only played The Crown last night, has already notched up some notable shows at The Lamb, was selected by the band after offering the support to Devizes Festival to make suggestions. This represents a fantastic step forward for our festival too, as not only do we have digital, on line tickets this year – but we’re opening up significant support slots to local bands and artists. Tickets go on sale May 1st via WeGotTickets (with booking fee), through the downloadable booking form on the festival website (without fee) or in person from Devizes books, priced at £20. Motivated country punk singer songwriter, Gaz Brookfield will be returning to Devizes on Sunday 18th November to perform at The Old Crown, in New Park Street. It’s the first musical event I’ve come across at the Crown for some time, and it will be fantastic to not only watch a very talented friend in my own back yard, but better yet, not have to worry about sorting anything out. The single Diet Of Banality, video below, will be released on 16th December via iTunes, 7 Digital and Amazon – with which Gaz is hoping to score a number one and piss all over Simon Cowell. Those with eagle eyes will notice Gaz features some fantastic backing band musicians, including Leks from Devil Sold His Soul! How’d you like my typical newspaper style tag line? Well the local lad in question, is none other than Swindonian and Sheer favourite Gaz Brookfield. Gaz, who has breezed through Devizes a few times, and a good few of the local villages too, is releasing his song “Diet Of Banality” as a Christmas single on 16th December 2012. The song doesn’t mix its words or leave you on the fence with his feelings towards X Factor, Britain’s Got Talent and all those other TV shows, which Gaz refers to ever so eloquently in the video, that I’ll never quite manage. Be a part of something superb, buy the single and help Gaz get to number one, ruining Simon Cowell’s Christmas, again in the process. If that’s not a motivation, I don’t know what is! Matthew Corbett steps up to the plate again, and will deliver his second session Live on Devizes Fantasy Radio, which you will be able to listen in on live via 87.9fm, or on line at http://www.fantasyradio.co.uk/. This week’s guests for Matthew include Gaz Brookfield live in Session a first for both the radio and Matthew. Phil Hardy will be returning for banter and chat over the latest film offerings, and again Sheer Music will be delivering the best the local music scene has to offer! So do tune in from 10pm. Gaz Brookfield is in town for another good reason, he is performing a proper 2 hour set at The Lamb, split nicely in half to accommodate his Radio performance. So check out this gig page for the full details on Facebook. His first set starts at 9pm, and after his preview on last weeks Fantasy Radio session, we are expecting it to be busy, with a few new faces from Swindon coming down to join the fun – make sure you get in early to get a space! Upstairs however I will be running a brand new night of Indie – this time featuring some awesome bands from across the south of England, Canterbury band C A N A L S bring some techy-wizardry, Falmouth’s L I T T L E L E A G U E S do the same with some elay soaked guitars and our very own S A I L O R S finish off the night in spectacular fashion! Brand new local band, City Of Lights are second on, just after Canals, and feature Curtis Wilcocks on axe duties. Can we call it an Axe, if they aren’t a metal band? Answers on a postcard, best answer gets a prize. VOTE WITH YOUR FEET, and hit the Lamb from 8pm please, and check it all out! Lastly, the nominated Charity for the night is Cancer Research UK, as volunteered by Warminster singer song writer, Georgie Vale. I will be making a payment to her on line Pledge site, so please continue with the donations on the door – it will make a huge difference to so many people!